Fourteen summer clay campers participated in the 2018 Mount Gretna Kids' Art Show this year. Despite looming rain, we managed to stay dry from 9am-3pm each day. The kids enjoyed conversing with customers, selling their wares and doing a little math! New classes at krb ceramics! In an effort to respond to student feedback to accommodate all ages -- this year we are offering project based classes for everyone. If you see something you like, click on the link and check out the special pricing! In closing, I've had two separate websites (this one for ceramics classes and one for my artwork karenrichbeall.com) for a few years now. I recently decided to combine them. So now you will see in the menu I've added a "shop" page that highlights items I have for sale--jewelry, functional housewares and a little art. I've also added a "gallery" page where you can see and learn about the artwork I've made for 30+ years. Stay tuned! Im working on some new project ideas for November and December classes. Thank you for your continued support of krb ceramics! It seems like winter will never end! But alas, no fear! I have seen the snow drops! After several sick days--both myself and the kids--Im ready for this winter season to end! Lets hope we can emerge outside to find the warmth of spring soon. Mushroom season is just around the corner! Here is what is happening at krb ceramics! 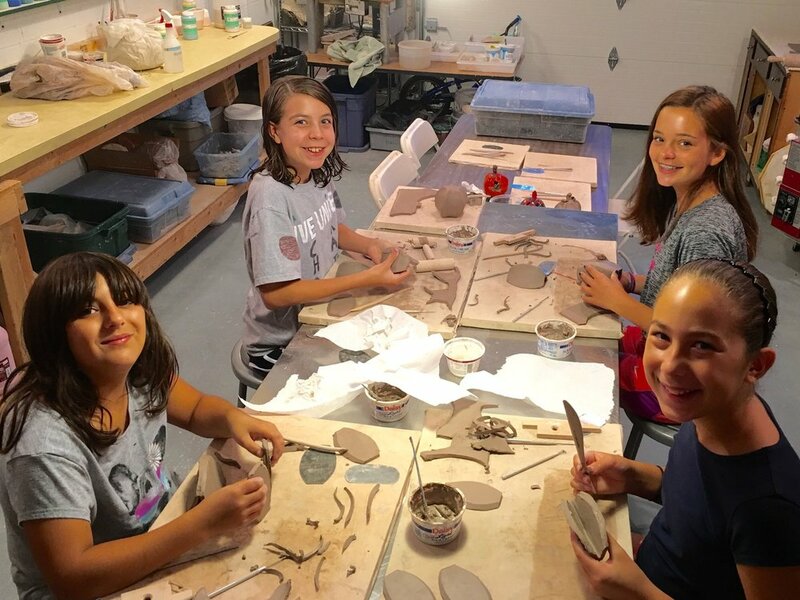 We announced Summer Clay Camps last month and had an early bird registration that included a discount. 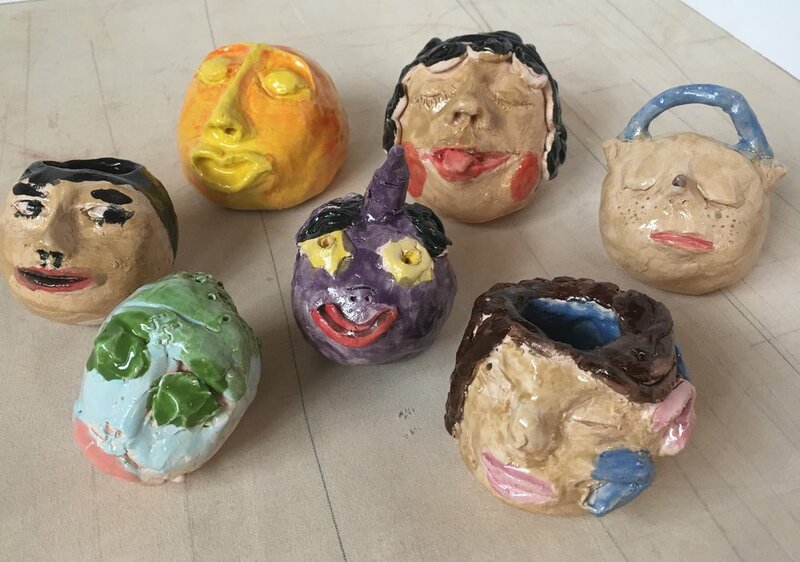 If you were not one of the organized people (wink, wink) that booked your child's summer clay camp then, there is still time! But don't delay too long! We only have so many spots this year for our regular camp. NEW for this year we are offering an "open studio" camp for the clay student with a bit more experience. As I have watched our young clay students learn and grow I thought I would offer a more "self-driven" camp this year. This is an important step in the development of well-rounded three-dimensional art makers. They can make what they want and experiment! We will also have some time on the wheel too. Please let me know if you have any questions about any of the camps. There is A LOT going on at krb ceramics! This weekend we will be participating--along with 15 other artists--in the Lebanon Valley Art Studio Tour for our second year. The krb Ceramics studio will be open to visitors Saturday, November 4, 10am-5pm and Sunday, November 5, 12-5pm. Here is an article that ran in the Lebanon Daily News about the tour. Starting in November, we will be offering adult and children's classes at the Mt. Gretna Brewery located on the corner of Horseshoe Pike (322) and South Forge Road (117) in Palmyra. Here are some pictures of my solo exhibition at Mary Baldwin University in Staunton, Virginia. We had a full house in the Chakra making class October 18. We recently welcomed a group of homeschoolers for a 5-week program creating ceramic art. There is space still available in these upcoming workshops. I know everyone is busy getting back to school—including me! Here is the fall clay camp schedule. Class registration will be open until NOON the Friday BEFORE class. I'm mixing it up again and trying some new ideas! Something for the yogi in your life...? The holidays will be upon us before we know it...make a special gift for someone! Try one, or all! Hamsas Wednesday, September 13, 6-8pm. Chakras Wednesday, October 18, 6-8pm. Monoprint platter Friday, November 10, 6-8pm. Eighteen Summer Clay Campers participated in the 2017 Mount Gretna Children's Art Show (this is DOUBLE the amount from last year!). The kids had a great time talking about their work and selling it---a total of 102 pieces! We had many people stop by the booth, chat, and purchase works by our budding artists. Congratulations to everyone! Thank you parents for all your help! If you are interested, Ive posted more pictures on the website. Please visit me this THIS FRIDAY August 4th! I am the featured artist at La Sorelle Restaurant in Mt. Gretna for “Mt. Gretna’s First Fridays” from 5:30-7:30 pm. La Sorelle is located in the heart of Gretna by the post office. We have one more week of Summer Clay Camp. There are 17 kids participating in the Mt. Gretna Children’s Art show! They will have lots of unique creations to sell at reasonable prices. Please stop by and support our budding artists! Our krb Ceramics booth will be on the basketball courts by the playground from 9am-3pm August 19th and 20th. The Fall Workshop schedule is now available! Hamsas- Decorate 3 ceramic, palm-shaped tiles using sgraffito and slip trailing techniques. Chakras- Create a ceramic tile wall hanging of the 7 chakras using sgraffito and slip trailing techniques. Mono-print Platter- Create a lovely serving platter using this expressive technique. "Whoville" Gingerbread House- A Suessian take on the traditional gingerbread house. Please check the krb ceramics.com website for all the details! I wanted to take a moment and thank you for your interest and support of krb Ceramics. We had a productive spring and are ready for the warm summer months ahead. We will have six weeks of summer camps from June-August. The children who attend the summer camp will create work to sell at the Mt. Gretna Children’s Art show which is a part of the annual Mt. Gretna Art show. The dates this year are August 19th and 20th, If you are coming to the art show please stop by and support our budding artists! Our booth will be on the basketball courts by the playground. I will be the featured artist at La Sorelle Restaurant in Mt. Gretna August 4th for “Mt. Gretna’s First Fridays” from 5:30-7:30 pm. La Sorelle is located in the heart of Gretna by the post office. Please stop by if you are in town. I am also having a solo show at Mary Baldwin University’s Hunt Gallery in Staunton, Virginia on October 2-27. There will be an opening reception on Monday, October 2, 4:30-6:00 p.m. In August look for the fall schedule of classes. As always, please feel free to contact me if you have any comments or suggestions. I am also available to design a class around any project of your choosing with a minimum of 3 people. I charge $20 per person per class. Send me an email and let’s schedule something now! She flew over farms and highways, cities and towns, forests and rivers," 2017. In celebration of Earth Day, I created a Public Art installation at Lebanon Valley College of 365 hand-painted paper monarch butterflies. As they fluttered in the breeze, they endured the wind, rain, and sun and gradually lost their color and became lifeless as a symbol of the butterflies’ current plight. This is the installation after 5 days. New 2017 Spring classes and Summer camps too! We are excited to share with you our revamped website! For your convenience, all class and camp information can now be accessed in one place. Your feedback is greatly appreciated, hope to see you in class soon! With the colder temperatures we were busy indoors creating snowflakes, sleighs with reindeers, and who-houses! We made lots of new friends this year. Thank you for your support! Clay Camp projects for September celebrate the fall season. Here are some pictures of the wet work from both classes. I can't wait to see these projects once they are fired and glazed! We will be located in the playground within the Mt Gretna Outdoor Art Show.